Jaou, the arts festival organised by Lina Lazaar to celebrate local arts and culture returned to Tunis for a second year. This year's programme included exhibitions of work by regional artists, local gallery tours and a day of critical discussion. The galleries of Sidi Bou Said opened their doors to visitors on the evening of 9th May followed by a cocktail reception for invited guests. The meeting of Arts and Culture in the Maghreb took place at the National Museum of Bardo on 10th May as part of the Jaou festival programme. Now in its third iteration, the meeting focussed on contemporary art centres in and around the Maghreb, with speakers from across the region and beyond invited to discuss the activities and development of their respective cultural institutions. Jaou Tunis 2014, visit of Ammar Farhat Galery (Sidi Bou Said). Image courtesy of Kamel Lazaar Foundation. Jaou Tunis 2014, visit of Le violon bleu Galery (Sidi Bou Said). Image courtesy of Kamel Lazaar Foundation. Jaou Tunis 2014, visit of Al Marsa Galery (la Marsa). Image courtesy of Kamel Lazaar Foundation. The conference was opened by Director of the National Museum of Bardo in Tunis, Moncef Ben Moussa, followed by a welcome address by Mr Kamel Lazaar, chairman of the Kamel Lazaar Foundation. Thanking all participants, including those who had travelled considerable distances to attend the conference, Mr Lazaar went on to stress the importance of continued dialogue and discussion between countries across the region. Mr Lazaar noted that whilst some issues are particular to the Maghreb, this was not, strictly speaking, a regional issue, but a global one affecting all institutions. The ambition of these conferences, he added, was to bring that global context to the region. Jaou 2014, second session of the first Panel, left-right: Faten Mehouchi, Adel Essandi, Bchira Triki, Mohamed Morabiti. Image courtesy of Kamel Lazaar Foundation. The first panel of the day brought together art centres from Morocco, Algeria and France to discuss cultural integration and civic participation. Redha Moali of Marrakech's Daral-Ma'mûn discussed the notion of citizenship in the Maghreb in relation to creative practices. The art centre, he argued, is a vital force for forging identities and engaging civil society. Djamel Aissani of the National Water Museum of Algeria spoke next, followed by Akila Goudjil of Association Rivages (RivagesdesArts). Goudjil gave an illustrated presentation of the residency programme she runs in Marseille, which gives artists from North Africa an opportunity to travel and develop their practices through such exchanges. After a short break, three panellists convened to continue the discussion around social and civic participation in the arts. Adel Essandi spoke about the problems of public policy in Morocco, and called for greater cultural infrastructure across the Maghreb to further human development and social inclusion. Speaking to similar themes, Mohamed Mourabiti described how the Al-Maqam Artists' Village in Morocco operates an art residency at the foot of the Atlas Mountains, despite a lack of government support and structure. B'chira Triki followed with an overview of the work done by B'chira Art Center in Tunisia. This was followed by the Director of Maison des Arts Tunis, Faten Mehouachi, who described the cultural activities of an organization that includes providing access to education for artists. Mohamed Mourabiti spoke to a similar concern, and over all, the discussions during the first half of the day generated a lively debate between panellists, as well as engagement and participation from the audience. Following a lunch break, the focus turned towards participatory art and creative spaces, in a session moderated by FIAF President Marie-Monique Steckel. Vincent Puig of the George Pompidou Centre Institute of Research and Innovation was joined by Moroccan artist Hassan Darsi, who questioned the role that art and artists can play in effecting social change. Other participants included Elizabeth Cestor of the Museum of European and Mediterranean Civilisations and art historian Paul Vandenbroeck. Vandenbroeck's presentation provided insight into modern and contemporary art practices in Morocco and Tunisia from 1994 to 2014. 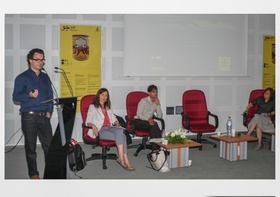 Jaou 2014, third Panel, left-right: Anthony Downey, Marie Muracciole, Aaron Cezar , Dina Matar. Image courtesy of Kamel Lazaar Foundation. The final panel of the day, 'Educating Future Institutions', was organized by Ibraaz (www.ibraaz.org) and brought together the expertise of three directors of global institutions: Aaron Cezar, Director of the Delfina Foundation in London, Dina Matar, Director of the Centre for Media and Film Studies at SOAS London, and Marie Muracciole, the newly-appointed Director of Beirut Art Center. Ibraaz Editor-in-Chief Anthony Downey began by introducing the work of Ibraaz before handing over to the panellists, who each described the work of their respective organization. Cezar addressed the notion of artist residencies and the opportunities for collaborative production that such residencies can produce. Similarly, Muracciole looked at the future of visitor and audience interaction in curatorial programming at Beirut Art Center. As an educator, Matar described the work of the School of Arts at SOAS in London, as it pioneers interdisciplinary study and ground breaking research and teaching. These speakers provided another, more global angle to the discussion of art institutions and cultural infrastructure, all the while emphasising the need for constant re-evaluation, development and improvement of art centres. Although the issues discussed throughout the day where varied and complex, most speakers agreed on the importance of visitor engagement and community participation, as well as the need for institutions to be spaces to educate the local with a global outlook. 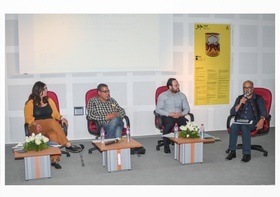 Ibraaz launched its seventh platform to coincide with Jaou Tunis and examines many of the issues discussed during the symposium, including the future of arts institutions and infrastructure in the Maghreb and the wider Middle East. Responses to the platform question, as well as essays, interviews and projects by artists can be read here. Following the conference and the knowledge it produced, Ibraaz will generate a network directory of institutions across the Maghreb to be published in 2015. The day of discussion was followed by a celebration at Palais D'Erlanger, an early 20th century palace built in the hills of Sidi Bou Said, now a platform for musical events. A group of musicians performed traditional Ma'luf songs native to North Africa within the opulent interior, as guests mingled on the terrace overlooking the Mediterranean. The next day saw visitors return to the national Museum of Bardo to hear the meeting's closing remarks by Mr Lazaar. A tour of the Northern suburbs of Tunis, where El Marsa gallery hosted a brunch amongst the works of Nidhal Chamekh, Fakhri El Gazel and Atef Maatallah, was also organised. Participants then had the opportunity to explore other local galleries including Le Violon Bleu and Selma Feriani who showcased the work of Tunisian artists Hela Ammar and Raja Aissa respectively. Observing that this conference and attendant activities were but a small action, Mr Lazaar and his daughter Lina, both expressed gratitude that so many participants had attended the event. They both hope to see the festival return with greater success next year, where it will look at issues around institution building in the region and education in the arts. The meeting is organized with the collaboration with Ibraaz Publishing and The French Institute, Tunisi.